Thomas Shea showcases his organic baked goods. Jay and Rucha Patel founded the Acton Academy Oakland County. Conducting market research, building your brand, pricing your product so you take a loss—these are tough lessons for any fledgling entrepreneur. 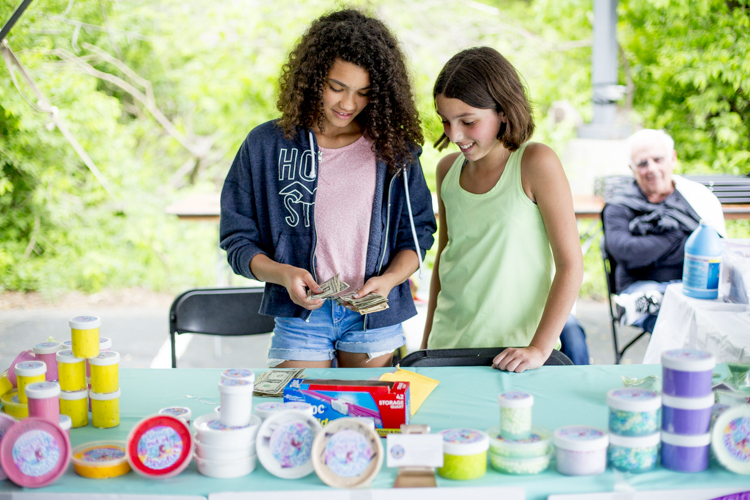 But the young entrepreneurs who took part in the Children's Business Fair, held Saturday, May 19 in downtown Rochester, are already well-versed in these topics. 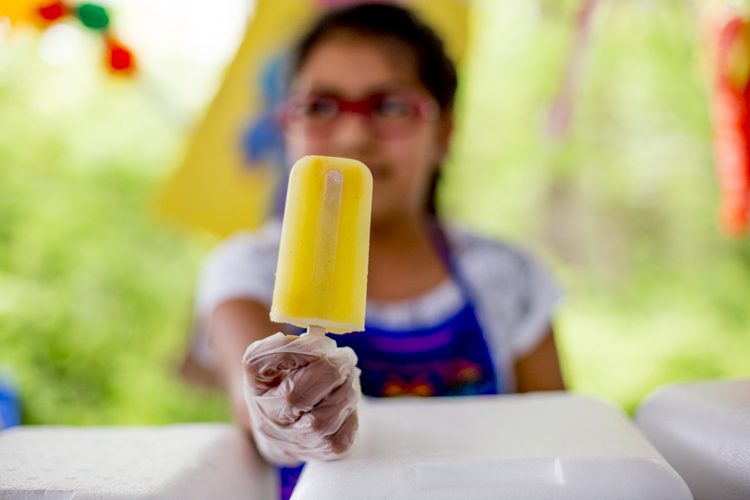 The young founders of Mexican Paradise, a popsicle stand, learned a lot on their first day on the job, and they were thoughtful about the presentation of their display. Their booth paid homage to their Mexican heritage, from their matching colorful outfits to the decorative parrot sign that adorned their exhibit. It was an especially humid Saturday, so they had a steady stream of customers seeking icy Jamaica flower, horchata, pineapple, guava and tamarind popsicles priced at $1.25 each. About an hour later the price had gone down to $1. When asked why, co-founder Mariana Caravallo, 10, said she and her partners, Andrea Munoz, 9, and her sister Sofia Munoz, 11, wanted to sell out. They had brought 40 popsicles of each flavor and between splitting their profit three ways plus paying the two girls wearing cardboard popsicle signs, they had a lot of expenses. They were hoping to make about $32 apiece. The Acton Children's Business Fair, which holds fairs around the world, features businesses launched by and run by youths. The Rochester event was organized by Acton Academy Oakland County, a private school in Rochester. It's one of dozens of schools around the country and the world, with locations in Taiwan, Spain and South Africa to name a few, with the original Acton Academy in Austin, Texas. With about 20 entrepreneurs showcasing their work, the fair helps kids "experience what it means to be an entrepreneur and start thinking like an entrepreneur," said Jay Patel, co-founder of Acton Academy Oakland County. Some of the entrepreneurs, such as 12-year-old Thomas Shea of White Lake, were new to business. Currently homeschooled but is enrolling in Oakdale Academy in Waterford Township next year, he initially had a different idea that involved injection molding but wasn’t able to do it in time for the fair, according to his mother, Diana. He shifted gears to Bakers Dozen, a 100 percent organic bakery with gluten- and nut-free products such as oatmeal cookies and a Vanilla Creeper cupcake inspired by Minecraft. Diana said she and Thomas were talking about expanding the business by offering delivery and she had suggested the service be free. "He said, 'No, I want to charge for it!'" Diana said. Caylin Brandon and Lila Barron count money from their slime sales. Some of the entrepreneurs were already veteran business owners, such as Lila Barron, 12, a student at The Roeper School. Lila has had her Slimes of Paradise business for about a year and has an Etsy shop and Instagram following of 2,000 with a goal of 10,000 followers. For Lila, the fair was the first time doing an in-person event, and she had already sold out of one of her slimes, a product she makes herself with glue and liquid starch, customizing it with scents and add-ins like beads and colors. For the event, she added a make-your-own-slime deal for $10. Halfway during the event, she said the fair was a good experience so far. "A lot of people didn’t know about me before and now they do," she said, getting a little closer to that 10,000th follower. One of the most important aspects of the fair was that the parents weren't allowed to help their young entrepreneurs. At the start of the fair, Patel told the parents to stand back and let the kids run the show. "Kids need to be more independent," said Manjiri Dani, whose daughter, Meera, was selling her mixed-media artwork at the fair. The philosophy of parents standing back and letting the kids take the lead was one of the reasons she wanted her daughter to participate. Meera, a fourth-grader at Meadowbrook Elementary, is the fourth generation in a family of artists. Manjiri, Meera and Meera's grandmother did a group exhibit at a local café and "that motivated her" to pursue art as a business, according to Manjiri. Meera also enlisted the help of her friend and Meadowbrook classmate Andrew Mahoney to help her market her business and attract customers. Indeed, he was working the crowds and touting the $20 special painting and 2-for-$50 special. Andrew's mother, Margaret Mahoney, said she used to have her own smoothie business and Andrew would help her sell—and he was good at it. Andrew said his father works in sales and some of that business savvy has rubbed off on him. "I asked him after school if he would help me and I would give him a fourth [of the profits]", Meera says. "He likes persuading." Letting the youths run their business their own way mirrors the philosophy at Acton Academy, which takes a nontraditional approach to education. A learner-centered environment, the school uses online adaptive learning programs, and instead of teachers, there are guides who are more like coaches. "At the end of the day the coach can't play the game," said Patel. "They can only coach the player during game time. The players play. We coach [the students] on how to become better learners. The focus in elementary school is to learn how to learn. … And once you do that the sky's the limit. You know you can do anything in life." Patel said his children were doing well academically in a traditional school environment but "as parents we felt that the education system was not a good fit for our kids and we looked at a lot of different options and we found that that nothing really fit and then we found the Acton model and it clicked right away." 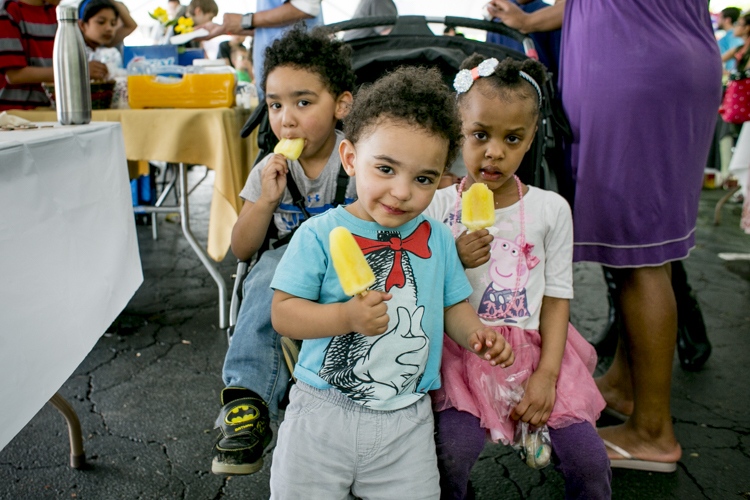 Children enjoy popsicles at the Children's Business Fair. They enrolled their kids at the Acton Academy in Ann Arbor where they attended for a year, and the family moved back to Oakland County to found their own Acton Academy. This is the first year for the Acton Academy in Oakland County, and this year three students, including two of Patel’s children, are enrolled. Patel said he projects growth every year and next school year is looking at having 10-15 students. "We don't have grades. We focus on mastery," Patel said. "The difference between grades and mastery is grades are to-the-test and mastery makes sure you've understood the concepts"
It's also "more than academics," Patel said. Acton helps build soft skills such as conflict resolution, team building and goal setting, and fosters "learning how to be a lifelong learner." "That was more important than a lot of the different approaches to education right now that are out there."